← Colonel Sanders: The Man Behind KFC’s Finger-lickin’ Good Fried Chicken! 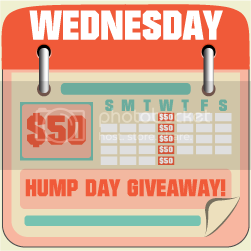 It’s Twitter Follow for this Week’s Hump Day $50 Giveaway! Oh, I miss Hump Day, but now I’m glad it’s back! Thanks to the 25 wonderful bloggers below who sponsored this event, it’s time for Hump Day Giveaway once again. This week’s task is for Twitter follow which is super easy to do. Feel free to visit all the wonderful blogs below once you’re done entering the giveaway. You can log on to Rafflecopter via your Facebook account, or your name and email (just make sure your Twitter is opened so you can easily follow the profiles). Once you’ve followed ALL the profiles (separate page to be opened through the Rafflecopter form), leave your Twitter username on the space provided for Extra Info on Rafflecopter after doing the task so we can verify your entry. 4 Responses to It’s Twitter Follow for this Week’s Hump Day $50 Giveaway! I joined! Thank you for this giveaway… Good luck! Glad its back. Joining the contest. thanks and good luck to everyone !